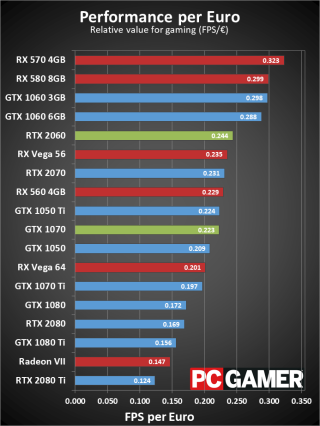 GeForce RTX 2060 vs GTX 1070: Which graphics card should you buy? Gamers barely had time to catch their collective breath after the cryptocurrency market tanked before Nvidia launched its GeForce RTX series, which in turn presented a conundrum—pay a premium for one of the newest and best graphics cards on the market, or save some money and invest in ‘old’ technology. For many, the answer was simple. Nvidia would later lament that RTX card sales had not met expectations, due to a combination of price and a lack of games supporting RTX’s staple features (real-time ray tracing and Deep Learning Super Sampling). But then came along the GeForce RTX 2060, making the path to RTX more affordable. You might now be wondering, should you buy a GeForce RTX 2060, or save a few bucks and buy a previous generation GeForce GTX 1070. The answer is not a straightforward one. Part of the decision comes to whether you want the newest technology and are willing to pay a bit extra for it, even if support is limited at the moment. It’s a fair question since the difference in price between a GeForce GTX 1070 and GeForce RTX 2060 is around $20-$50, whereas previously you would be looking at spending several hundred dollars extra for an RTX card. So, we’re here to break it down. Let’s start with the technical specs. The GeForce RTX 2060 has 1,920 stream processors (or CUDA cores), 120 texture units, 48 ROP units, and 240 tensor cores, along with 6GB of GDDR6 memory. Unlike the other RTX cards, Nvidia’s Founders Edition is not overclocked, so there are not two separate sets of clockspeeds—the GeForce RTX 2060 sports a 1,365MHz base clock and 1,680MHz boost clock. 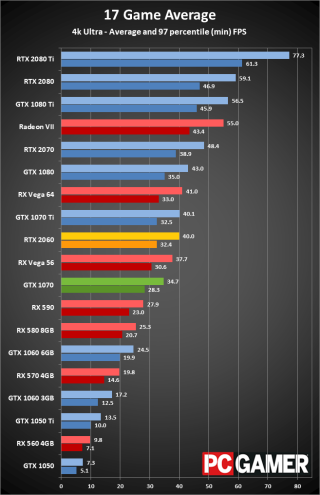 Since the GeForce RTX 2060 is based on Nvidia’s latest Turing GPU architecture, it also has dedicated RT cores (30 of them) to handle real-time ray tracing chores, and supports DLSS. 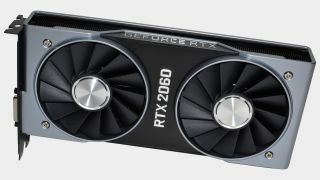 The card is basically a toned down version of the GeForce RTX 2070 at a much more attractive price ($349 instead of $499 and up). The GeForce GTX 1070 also has 1,920 stream processors/CUDA cores and 120 texture units, but 64 ROPs and 8GB of GDDR5 memory. Reference base and boost clocks are set at 1,506MHz and 1,683MHz, respectively. You’ll notice there is no mention of Tensor cores. That’s because they’re not present in Pascal, only Turing (and Volta). Tensor cores are what give GeForce RTX cards their deep learning capabilities, which are used for DLSS. RT cores are obviously out as well. 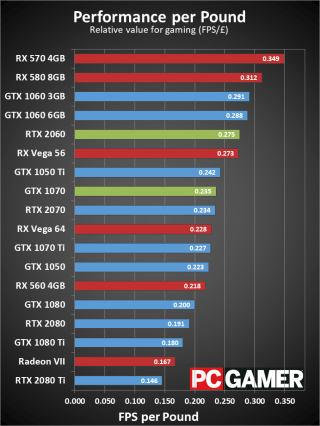 Technical specs are one thing, but what really matters is how each card performs. Short and to the point, the GeForce RTX 2060 is a faster card that consistently delivers higher framerates than the GeForce GTX 1070. Case closed, right? Well, let’s see. 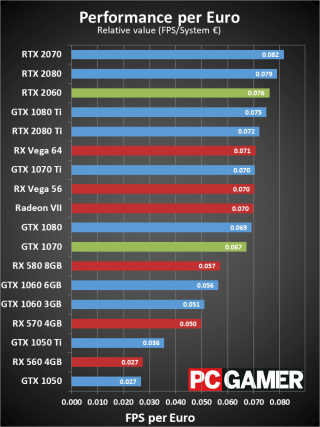 In our testing of 17 different games, the GeForce RTX 2060 is around 15 percent faster on average at 1080p using ultra settings, and around 14.5 percent faster at 1440p, also at ultra settings. We generally don’t recommend buying a $299 or $349 graphics card for gaming at 4K, because it’s not realistic to expect a hiccup free experience in every game. 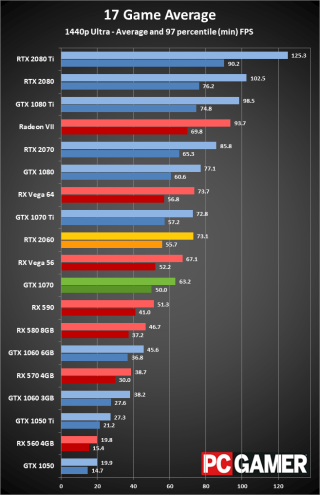 That said, the GeForce RTX 2060 is around 13 percent faster at that resolution as well. That’s a little deceiving though, because neither card is a good option for 4K ultra gameplay. You can get away with it in some games, but both cards will definitely struggle in ones that are more demanding. That leaves us to analyze the 1080p and 1440p results. 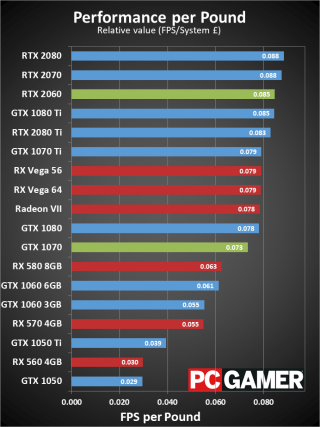 The GeForce RTX 2060 is the clear winner, as we would expect it to be, given the specs. It doesn’t matter in games like Fortnite, where the GeForce GTX 1070 averages 83 frames per second at 1440p, but in a game like Middle-Earth: Shadow of War, it can be the difference between hitting that magical 60 fps mark or coming in below. Still, we’re not talking about a night and day difference in most case, so let’s move on. The GeForce RTX 2060 starts at $349.99 and you can even find factory overclocked models at that price point, such as Gigabyte’s GeForce RTX 2060 OC GG. You also get a free game right now—your choice between Anthem or Battlefield 5. Likewise, the GeForce GTX 1070 is similarly priced, though it depends on where you live and availability is becoming limited. 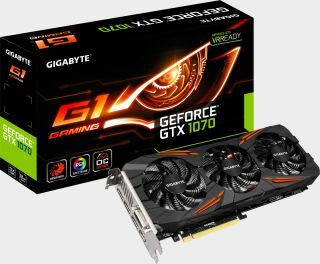 If you strike at the right time, though, you can find it for $299, as is the case with this Gigabyte GeForce GTX 1070 Gaming that is on sale. That particular card also comes with a Fortnite bundle, if that matters to you. More often than not, though, the GeForce GTX 1070 goes for a bit higher, usually $330 and up. 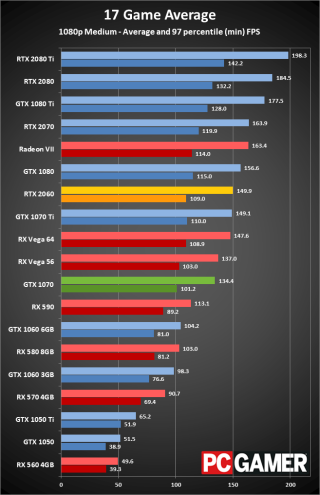 It still squeaks ahead with a slightly better fps per dollar ratio, though not by a lot. For the UK and European markets meanwhile, it’s harder to find the GTX 1070 at decent prices, making the RTX 2060 the easy pick. If you already have a 1070, though, that’s a different matter—we wouldn’t recommend spending the money for such a small performance increase. If you’re looking at building a new gaming PC, the cost of the rest of the components makes the RTX 2060 an easy pick. Spending $20 or even $50 more on a $1000 build is well worth it for the performance upgrade. Here’s what it all boils down to—the GeForce RTX 2060 is a little faster than the GeForce GTX 1070, it’s more widely available (Pascal cards are starting to disappear), and it’s more capable, even though not many games support real-time ray tracing or DLSS. In fact, there are only two right now that support both—Battlefield 5 and Metro Exodus. 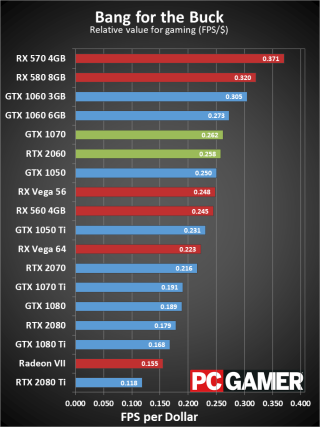 However, the lack of support is a bigger deal when comparing Nvidia’s more expensive GeForce RTX cards. Barring a sale, the difference in price between the current generation GeForce RTX 2060 and previous generation GeForce GTX 1070 is around $20, and in some cases there is no difference at all. Bottom line: as we said in our review of the GeForce GTX 2060, it’s the best upper midrange card (or lower high-end card) that we’ve seen since the GeForce GTX 1070 Ti. 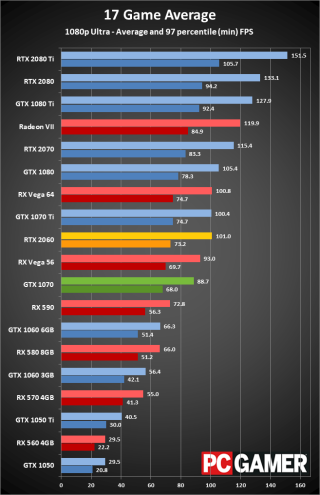 It makes sense to spend the little bit extra (over the GeForce GTX 1070) for the added speed, and treat the additional (ray tracing, DLSS) features as a bonus.